This Saturday Munky King will be hosting a release party for the second colorway of Luke Chueh’s new The Prisoner resin figure! Based on Luke Chueh’s original painting, The Prisoner ponders captivity in its many forms—physical, mental, or in some cases, pharmaceutical. 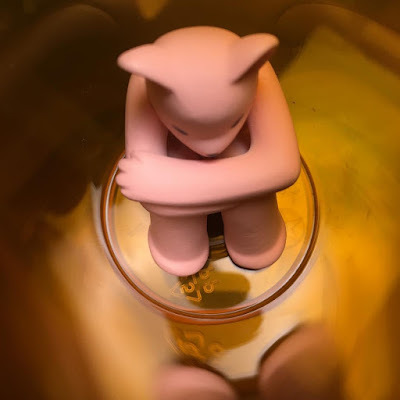 The Oxycontin Edition The Prisoner features a 1.5” pink Bear in an Oxycontin pill bottle. This version of the sculpture attempts to match the pink color of Purdue Pharma's infamous opiode pain killer, the 20mg Oxycontin pill. 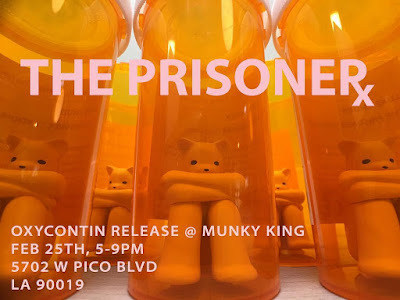 The release party will take place from 5pm-9pm on Saturday, February 25th, at the new Munky King studio space (5702 W Pico Blvd., Los Angeles, CA 90019), and will feature food, drinks, music and mystery releases. Any remaining pieces will go up for sale at the Munky King online store after the weekend.